The game of football has changed over the years and today we are faced with a more complex one more in line with our modern age. I got to thinking how much the role of the Goalkeeper has changed during that time. Compared with the old pre-1950s type the keeper is now a completely different animal. I use the word ‘animal’ as it appears to be an apt word in my recollection of the ‘stalwarts’ ‘between the sticks’ of bygone days. The old timers very rarely ventured very far from their goal area. In fact, if I can recall rightly, most of them used to spend most of their time prowling up and down their goal line almost like caged lions or tigers. In their off moments when play was safely up the other end of the pitch they would sometimes prop themselves by one of the goalposts; leaning almost nonchalantly and lazy. Legs crossed and arms folded. Sometimes they would even indulge in a little small talk or banter with the vast crowd that were on the terraces directly behind them. When any play came nearer to their half of the pitch they would take up position for defending their goal by moving forward slightly and crouching gently as if ready to deal with any incoming shot. Sometimes this called for them to actually move or even dive to avert the ball from entering the net. Even the goalkeeper’s strip of that era was so different. The normal kit for them was a thick polo necked jersey, long shorts and thick woolly socks. And of course, big heavy looking football boots fitted with large studs. Some keepers even wore tight fitting bandages covering their knees. I often used to wonder how they could even bend their legs let alone dive about with any agility. Their outward appearance would be completed by the wearing of a ‘Norman Wisdom’ type cloth cap usually pulled down well over their forehead. This was worn in all weathers but mainly when sunny, to shield the bright lights from their eyes. In mid winter, when the elements were really low and freezing cold, a suitable pair of gloves was added to the strip. But usually, cap and gloves were just slung down in a convenient corner of the goal interior until required. In them days there was no such thing as floodlights; also kick-off used to vary according to the time of the season. I am talking about the dark wartime days now, when I spent most of my boyhood days almost as part of the ‘fixtures and fittings’ of the Champion Hill stadium, which I regard as the very best and finest amateur/non-league ground there has been: but that’s another story! Certainly every Saturday I could be found roaming around somewhere on the vast terraces of Dulwich Hamlet Football Club. And even at other odd times throughout the weekdays, even when no matches were due to be played. In my youthful times I loved the old ground so much and would spend many joyful hours there. I was brought down to the Hamlet by my dad and granddad when I was little more than a young nipper, so I have very vague memories of watching the great England amateur international Haydn Hill in action. But I do remember him as somewhat of a local favourite at the time. The two goalkeepers I remember most from my boyhood days were Alec Freeman and Eric Mulley. I believe big Alec was the youngest and more regular custodian between the sticks whilst Eric who had joined us from the defunct Nunhead club early in the wartime period, was slightly better. Both were fairly reliable keepers and between them they shared the keeper’s jersey during those wartime years. I’m not certain when Eric hung up his boots, but I do remember Alec played on until the early 1950s before emigrating to Australia. However, he reserved one of his finest performances for the London Senior Cup Final at Arsenal’s Highbury ground in the 1949/50 season. His first half display was hailed as one of the best ever, and inspired our lads to go on to record a fine second half victory on the day. Alec was for sure a big towering fella. To my boyish eyes standing directly behind his goal area he looked massive and a very commanding figure. I remember one wartime game when both keepers were available to play, so with Eric donning the jersey we were treated to the sight of this giant of a man playing out on the right wing position. I cannot remember if he scored at all but I can recall he was cheered every time he had the ball at his feet attempting to dribble down the flanks! The keepers were colourful characters, always dressed in smart high necked jerseys. Royal blue was one of the favourites of the time although from time to time Alec would sport a bright yellow or amber one. I would sometimes wonder if Alec should rightly wear this colour as I was always under the impression that one had to be an international in order to be entitled to this particular colour. 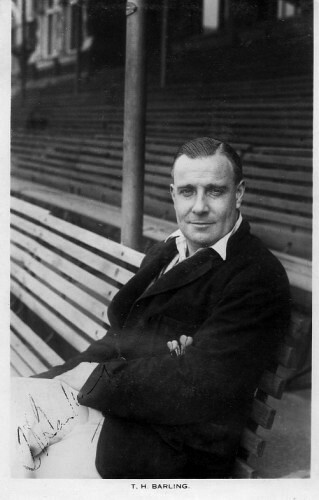 Alec had played for London and Surrey and also represented the FA XI. The jerseys always proudly sported the Dulwich Hamlet badge on their breast pocket although because of the wartime restrictions these were sometimes slightly tattered and torn, as was the rest of their kit which was a few years old and not been replaced so easy as in these much more affluent times. One keeper who was entitled to wear the amber jersey because I believe he was an England international, was a chap called K.G. Whitehead. Ken Whitehead came down and played a number of games for the Hamlet. I think he had enjoyed a successful time playing up north for a team called Yorkshire Amateurs. As a serviceman he may have been stationed somewhere in the London area so he chose to play as a guest for Dulwich. Many players that were serving in the armed forces at the time were able to do this. To my young eyes Ken was a slightly balding older player who was perhaps passed his prime as I cannot recall him being all that spectacular or particularly agile. However he must have been good to obtain international honours. He nearly always wore a drab grey jersey so he did not figure much as a favourite or hero of mine. Another keeper I remember from them days was chap named Norman Gosney. I always thought he appeared a bit too suave to be playing soccer. He looked more like a bandleader. . I think this was because there was a well known dance band leader by the name of Geraldo at the time and I thought Norman resembled him. Soon after the war finished, although I continued to follow the fortunes of Dulwich, I became a bit adventurous and started to watch the professional game, mainly Charlton, where I discovered the great Sam Bartram. He was certainly a daring and audacious figure often leaving his goal line to run out onto the main field of play to tackle or even head the ball away from danger. Having never witnessed anything of this style of goalkeeping before he became a hero of mine, and I suppose was the main reason I came to follow Charlton Athletic for most part of the early fifties. When I returned to follow the Hamlet in the mid fifties, Dave Darvill (above) was the resident custodian “between the sticks”. At that time he looked and dressed like a keeper from the old school wearing the traditional high necked polo jersey – usually a maroon one, if I remember correctly. Later on he became somewhat of a trendsetter in parading the more modern type of kit. He was one of the first players I know to start wearing the more lightweight style of jersey and shorter shorts. (Lighter boots were also beginning to come in at that time.) Dave would often wear an all-one-colour matching outfit of either royal blue or light green. His style of keeping was more in line with the modern game and he was a fairly steady and reliable sort of keeper. He used to amaze me at times by just standing on the line and plucking a really blistering shot from out of the air with such ease. He made the art of goalkeeping look easy but like all keepers he did have his occasional off days, but these were very rare. As one of the Hamlet’s long standing keepers Dave was pretty solid and consistent. Our reserve and second choice keeper at the time was our old mate Cyril Nash, who when called upon always performed admirably and provided safe cover. However due to Mr Darvill being almost ever present, Cyril’s chances of a slice of the fame were slim and very limited. Dave wore the Hamlet keeper’s jersey for a record 457 times. The only other keeper to get anywhere near that figure in recent times was Alan Thomas who made 224. Over the years Dulwich have been lucky to have had some fair old keepers on their books. Most of them have always proved to be safe and reliable but like all goalkeepers a little bit crazy … well, they say it helps to be a bit mad … and we have had our share of them. To emphasise the point on how much the role of the goalkeeper has changed we now witness the sometimes farcical sight of goalies chasing up-field to join the attack. A far cry from the days when they stuck rigidly to their line. Incidentally, this is not a totally new thing. If my memory serves me well we used to employ this tactic in games in the school playground or back in the times when we played in the street. The term ‘rush goalie’ comes to mind! Our old mate Les Cleevely, who clocked up 156 appearances, was somebody who revelled in this madcap tactic. The headwear has also changed over the years we had a period when baseball type caps were the ‘in-fashion’. But ‘allo allo’ what’s the latest? We now have a keeper in the premiership that wears a flying helmet!! One wonders if this headgear is to protect his latest hair-do. Or maybe he may produce a stick of wet celery to mesmerise the opposing team from scoring. 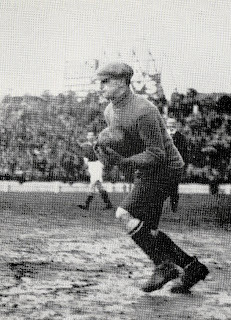 Perhaps I still have cotton wool in my ears to drown out the sound of the bombs, but I did not hear the public announcement that Biggles was in goal! One now expects good old Rockfist Rogan from the now defunct wartime comic Champion to be on the subs bench. Even during wartime with the enemy aircraft overhead do I recall ever seeing a goalkeeper sporting a tin helmet. Anyway, I take my hat off to cheer the many goalkeepers I have seen over the years. They do a wonderful job … but they have to be mad to become a goalkeeper in the first place. Original article from HH19 Autumn 2007. Did you hear the one about the Englishman, the Irishmen and the Coleman? 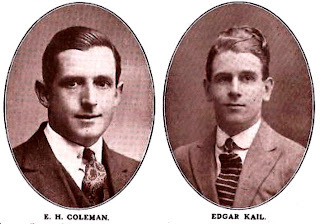 Edgar Kail was a mere teenager when he made his international debut for the England Amateur team. Just two weeks off his twentieth birthday, it should have been very daunting for a debutant of such youth, but Kail was already a Champion and a Cup Winner, a feat which had eluded even some of the great veterans of the amateur game. Alongside him in the team that day was his team-mate from Dulwich Hamlet, E.H. Coleman. ‘Tim’ Coleman was the outstanding amateur goalkeeper of his day and like his young friend gained several amateur caps and full honours with the England team. He had also been chosen for the Olympic team in the summer games in Antwerp, but for some reason was unable to play. His association with Dulwich Hamlet began before the Great War when he played second fiddle to Jack Thompson. Yet such was his outstanding ability that within a matter of only a few months he had taken over the Hamlet keeper's jersey permanently. The England v Ireland game was an annual fixture that dated back to the 1905-06 season stopping only for the war period. It was resumed in 1919 at Derby County’s Baseball Ground, and was next due to be played at Cliftonville in Belfast in November 1920. But this had become something of a worry as the Sinn Fein uprisings were now at a height, and the authorities, expecting protests from the Irish fans, were concerned for the safety of the English players. However, hundreds of armed policeman were drafted in to enable the game to go ahead. In fact Ireland was a dangerous place to be altogether after the First World War. Irish nationalists fought against British rule, engaging in a bloody civil war that eventually led to the partitioning of Northern Ireland and the Republic the following year. There was no guaranteed safety at sports events either, and only a week after the England v Ireland international a dozen or so people, including one player, were shot dead at a Gaelic football match in Croke Park, Dublin, by the British Black & Tans in retaliation to some assassinations earlier the same day. In Belfast England’s Amateurs won the game 4-0, but the scoreline flattered them. The man of the match was not the gifted teenager or one of the famed Corinthians, but the brilliant custodian who put on a breathtaking display of acrobatic goalkeeping that kept out the Irishmen. As soon as the referee blew the final whistle things began to get out of hand as the crowds broke through the police cordon and swarmed onto the pitch. The English players fearing for their own safety quickly made their way towards the sanctuary of the dressing room. One English player, however, was caught by the multitude, and for a few moments the rest of the players had their hearts in their mouths. But they needn't have worried, the crowd having caught the man they were after – Tim Coleman – lifted him aloft and carried him from the field shoulder high in great esteem. He must have been the proudest man in town. The remarkable incident made a great impression on the England side and the young Edgar Kail especially, who never forgot the event. versus Wales at Cardiff in March 1921. Original article from HH21 Spring 2009.